In Italian, the word Bufala (if you couldn’t guess) means Buffalo: as in the mighty animal and the delicious mozzarella cheese, but the word can also signify something that is meant to be a joke, or a humorous story. At least that’s what I was told when I visited Fratelli La Bufala, a new European-based chain Pizza restaurant that opened its doors on Broadway and 76th Street on April 27th. One might ask if New York City really needs another pizza restaurant, let alone a chain restaurant just getting its feet wet in America. But early signs point to Fratelli la Bufala having something unique to offer. The Fratelli La Bufala brand (FLB) was established in Naples, Italy in 2003 by three partners, who created a whimsical back-story for their road to success, recounted as an old-fashioned fairy tale. The story goes that, after the loss of their father, the young and brave Fratelli brothers emigrated to different corners of the world in search of fame and adventure. After many years of hard work, they joined together their respective successful pizza restaurant ventures, which today account for 100 Fratelli La Bufala (literal translation: Brothers of the Buffalo) restaurants in major cities across Europe, and now in the US (the NYC location is only the second in the US after Miami) with plans to expand further. As soon as you enter the lively and bustling space, you’ll see the impressive black pizza oven attended to by three authentically regional chefs, who came over from Naples to work and train new employees in the ways of pizza making. Once we gazed upon these hot and deliciously fragrant pies travelling from the oven to various tables across the restaurant, we knew we had to taste them. Since we had brought only a modest appetite, we chose to focus on sharing one pie, knowing that future visits were likely so we could sample many other selections. 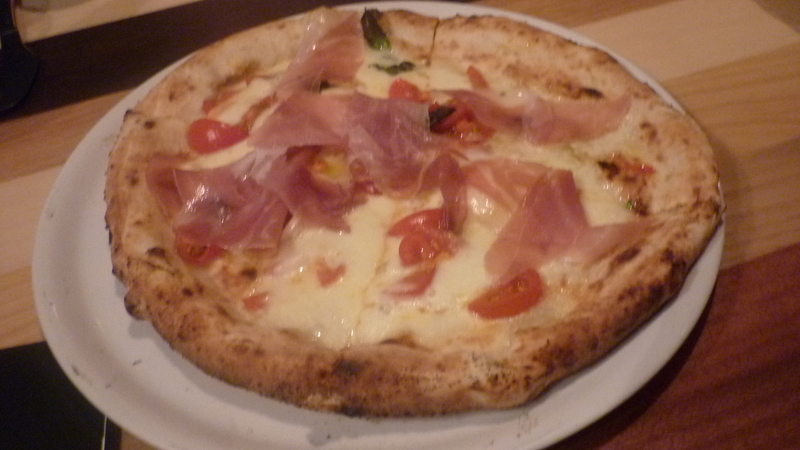 Our choice was the La Reale ($20.50), a white (sauce-less) pie covered with mozzarella, provola and ricotta cheeses, cherry tomatoes, and plentiful portions of salty prosciutto. To us, there is no such thing as too much cheese, and this was one of the most luxuriously cheesey pizzas we’ve tasted. Dare we say it: Best on the Upper West Side! The pizza also has a wonderfully chewy-crisp thin crust, which is what you expect from old fashioned oven-baked pies like these. Add a big green salad and you’ve got a feast that will satisfy any appetite. 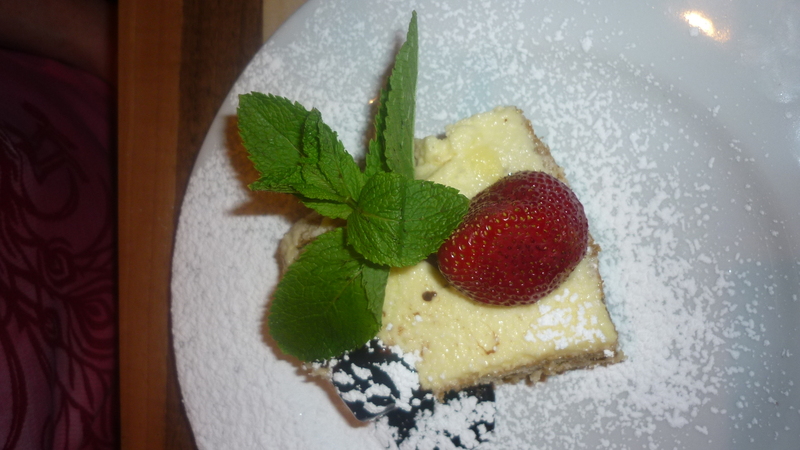 Of course, we also had to try a dessert, and their rich and creamy Tiramisu ($9) ranks among the best. Mangia! With Fratelli La Bufalo open for just under a month, as expected, they still have a few wrinkles to iron out, which we’ll make you aware of now. When we visited, the gas grill was not yet in operation, which meant that none of the menu’s featured meat dishes (including the mashed potato-stuffed meatballs and the rib eye steak) were available. Likewise, several pasta dishes (and even a featured dessert) were unavailable for whatever reason, so it’s advisable to either stick to ordering the pizza, or be sure to ask before you start perusing the menu’s many color photo-studded pages if there are certain dishes which are ‘off menu’ that day. On the upside, the NYC location is lovely and comfortable with an engaging ambiance. The interiors were designed by Lelia Castellano and include colorful murals and pop art paintings by Antonio Montariello. It’s simple, but chic, modern and unpretentious. And the pizza really is delicious. Fratelli La Bufala is Located at 2161 Broadway at the Northwest Corner of 76th Street, New York, NY 10024 ( just blocks from the 1, 2 and 3 trains at 72nd Street). Phone 212-496-5303 or visit their website at This Link for more information. The Restaurant does not accept reservations at this time. D R O O L ! Why is it that we eat with our eyes? That pizza looks heavenly! #FoodPorn!